Three different copies: backups of your original data, plus two copies, stored in different places. This does not mean in different folders on the same hard drive or flash drive. Three copies of data ensure a higher likelihood that one copy of your data will survive. By keeping them in different places, you're reducing the risk that one catastrophic event will destroy all of your backups. These days, making copies is pretty easy - and in this case, more copies is better safe than sorry. Using two different methods to backup is security because having a copy on the same type of media or even the same device can still make it inaccessible in event of a hardware failure. Backup options include tapes, external hard drives, USB drives, the cloud, two internal disk drives on different devices, or even DVDs. So, for example, backing up data to a USB (format one) from your hard drive (format two) satisfies the rule. For many years tape was the standard backup media choice and a full backup was physically taken offsite at regular intervals and stored. Retrieving back up data took a lot of time and scheduling. Now, most backups are uploaded to the cloud or stored in a remote (offsite) repository. 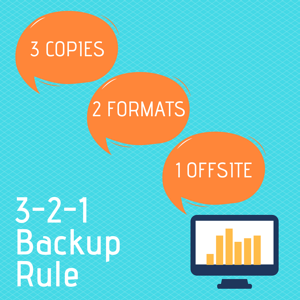 Storing one backup copy offsite ensures that even if the two copies you have with you are unusable (think theft or water damage), you still have at least one safe backup copy elsewhere. Ideally, you want your third backup site to be some safe distance away from you (generally at least 250 miles) so that in case of disaster in your city or region, your data is still secure and recoverable. Cloud backup is not a replacement for backups, but is another way to backup and store your data. The cloud is considered "offsite" so it is a good place to store data. Cloud backup providers and infrastructure make backing up to the cloud much easier than before. Cloud solutions often offer an easy-to-use portal or dashboard for customer control and adjustment. Cloud software will automatically backup your computer to cloud storage at regular intervals the customer chooses. This type of automated backup process is fairly standard to external hard drives or other network-type solutions. Investing the time and energy in a good data protection routine is an insurance policy anyone and any business needs. Making data backup part of your digital routine gives you access to your data whenever you need it. The 3-2-1 Rule is very simple and can work with any environment (physical, virtual, consumer or corporate). Digital West offer backup plans that lowers the probability of total data loss and help augment business continuity and can mitigate recovery costs. Our local customer service team is always available to help you. Call us at (805) 548-8000 to learn more about data insurance for your business.